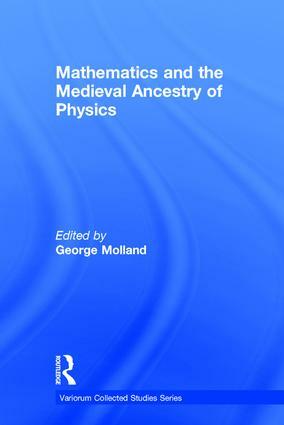 The central theme of this volume lies in the medieval consciousness of mathematics, and the variety of strategies adopted to apply it in other areas, notably natural philosophy. In diachromic terms, Dr Molland considers ways in which ancient mathematics (particularly geometry) was assimilated in the Middle Ages, and how it was radically transformed in the 17th century, especially by Descartes. A pervasive concern is with ideas of scientific progress: the author argues that medieval commentatorial and disputational modes encouraged probing attitudes to existing knowledge, aimed at deepening individual understanding, rather than more aggressive endeavours to advance public knowledge characteristic of later periods. What brought about this change is the subject of several studies here; others form more specifically on individual scholars, in particular the important figure of Roger Bacon. Contents: An examination of Bradwardine’s geometry; Campanus and Eudoxus: or, trouble with texts and quantifiers; Shifting the foundations: Descartes’s transformation of ancient geometry; Implicit versus explicit geometrical methodologies: the case of construction; The geometrical background to the ’Merton School’; Richard Swineshead and continuously varying quanitites; John Dumbleton and the status of geometrical optics; Cornelius Agrippa’s mathematical magic; Ancestors of physics; Colonizing the world for mathematics: the diversity of medieval strategies; Roger Bacon as magician; Nicole Oresme and scientific progress; Medieval ideas of scientific progress; Mathematics in the thought of Albertus Magnus; The atomization of motion: a facet of the scientific revolution; Continuity and measure in medieval natural philosophy; The Oresmian style: semi-mathematical, semi-holistic; Index.